Westgate provided a solution with a bespoke flexible wall system from their product portfolio. From conception to completion the project was turn key managed which fully complied with Amcor’s stringent safety rules and food hygiene standards. Installation was flexible around Amcor work flow yet was still completed “on time in full.” Amcor are a leader in responsible global packaging solutions. They supply a broad range of rigid and flexible packaging products for a variety of industries including food, beverage, healthcare, home, personal care and tobacco. With over 200 sites across 43 countries and boasting global sales of 9.1 Billion USD, Westgate were privileged to be able to work on a project at their Evesham site. Amcor warm raw material within an insulated steel clad enclosure to make it easier to work with. The area within the enclosure is also heated to assist with this process.Due to increased production Amcor needed a larger space in which to carry out this operation. Instead of creating a whole new area with new heaters, they evaluated it would be more cost effective to simply extend the existing area. Westgate were approached to help create an enclosure to provide this extension. 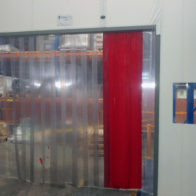 A two-sided Flexiwall enclosure 15m long x 8m wide was installed next to the existing area and an opening between the two areas was created to allow the warm air to circulate. A PVC strip door was installed, which offered a cost effective solution for unrestricted access and maximum heat retention. 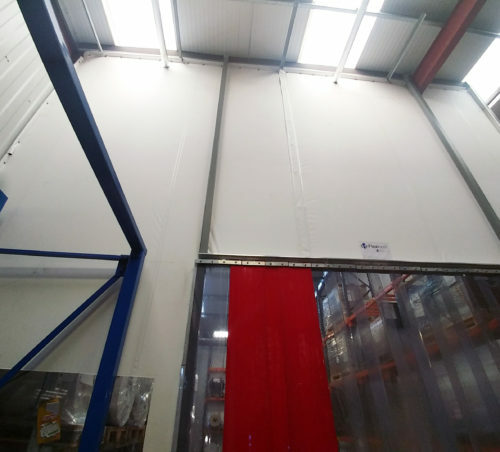 Flexiwall was the ideal solution for this requirement as it can be easily manufactured and installed to fit the exact profile of the building, creating a tight seal for maximum air flow and temperature consistency. Through Flexiwall, defined areas can be easily created and enclosures only require a small footprint at the base (tens of millimetres) as lightweight, fire rated materials are suspended from the existing steel work and battened to create tension. 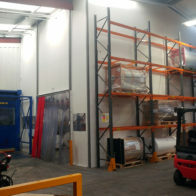 Vision panels were incorporated into the Flexiwall as this was a busy area for forklifts and personnel, ensuring the health and safety of all employees. Amcor Evesham have benefited from an overall cost effective project as they did not need to purchase additional heating equipment and only needed to heat the newly extended area, which also improved costs relating to energy-efficiency. The enclosure could also be installed between existing racking. This negated any need for reconfiguration of the space, which would have extended the time frame of the project and increased the associated costs.